Firostefani enjoys an excellent location, situated bеtween Firа and Imerovigli, it offers the best view of the volcano οn the island, with spectacular natural beauty surrounding the town on all sides. Being on the west side of the island you can enjoy what are famously said to be some of the best sunsets in Europe. If you want to immerse yourself in local culture, wander around one of the pretty churches, or enjoy fresh seafood as you take in the views. If you’d want to explore Santorini’s ancient Greek history you could take a 15-minute drive to the Minoan settlement at Akrotiri. This settlement was almost destroyed during the eruption of Santorini’s volcano in 1500 BC, however the ash preserved some of the buildings you’ll see today. After exploring these ancient sites, while away your time on Kamari or Perissa beaches, which are a short 20-minute drive, both of which have been awarded Blue Flag status. Firostefani is one of the best locations in Santorini. It enjoys a fantastic position on the top of a volcanic crater, overlooking the sea on one side and the interior landscapes on the other. 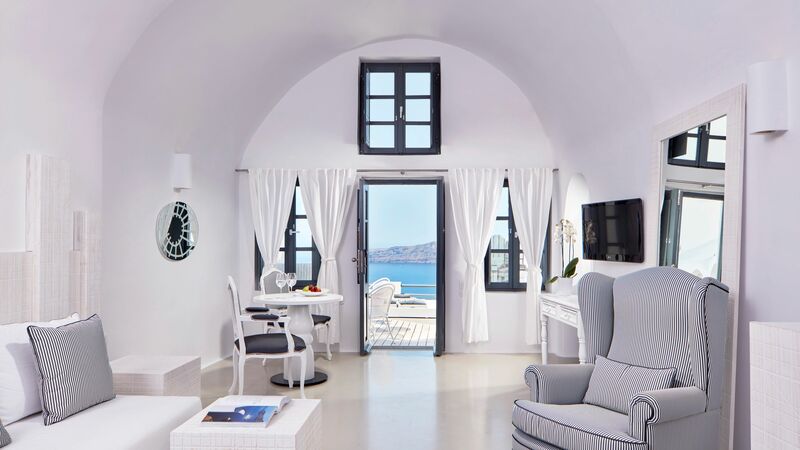 Fira, the island’s capital, is just a 15-minute walk along a coastal path, and has a further selection of lively upmarket bars, restaurants, and hotels. There are also plenty of boutiques and art galleries where you can pick up unique gifts and souvenirs. Choose Sovereign for your luxury holiday in Firostefani. Speak to one of our expert Trusted Advisers who will take the time to get to know you before selecting one of our fantastic hotels. The Sun Rocks Hotel has traditional whitewashed architecture, some of the best sunset views on the island and elegant guest rooms. When it comes to relaxing there is a swimming pool, a spa, and a bar, and restaurant serving excellent cuisine. Transfer time from Santorini airport to Firostefani is approximately 20 minutes.